[flickr]7774915380[/flickr] Have you ever wondered what the world of Formula 1 twitter looks like ..? No? Well maybe you should. The use of twitter as a social communication space has embraced the widening of its use to, amongst other things, augment TV broadcasts, live event consumption and now it allows fans of any sport you could mention to follow their favorite teams and stars with a 24/7 feed of information and updates. Formula 1 has been at the forefront of social media channel exploitation to give fans access to the rarefied world which exists behinds the scenes in this global sport. All twelve teams have adopted twitter as part of their social media communication strategies – with varying degrees of information and levels of communication being employed. Generally, the team accounts provide a top level communication in a simple hierarchy, with driver and team member accounts completing the landscape with individualized information for fans and interested followers. 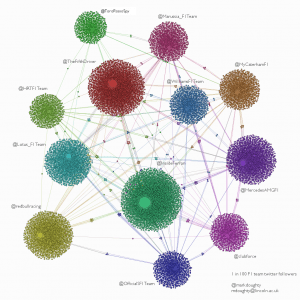 In this post we look at the teams and how followers are distributed among them. 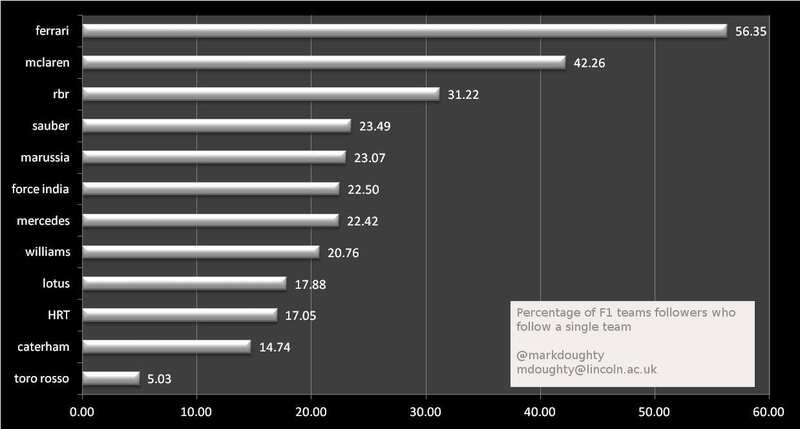 An analysis of how drivers fare on twitter will follow. Each of the twelve teams have a twitter follower-base which range from a modest 47,000 for Toro Rosso, to 316,173 for Ferrari. The number of unique followers in these totals is 670,300, which doesn’t sound like a lot when it comes to a global sport such as F1. When analysing twitter user numbers when related to large scale phenomena such as sports fans and TV show audiences it becomes apparent that twitter, while generating vast quantities of information and data, actually only accounts for, in the case of TV audiences a small percentage (< 5%) of the viewing audience. This effect is more pronounced for F1. With a global audience figure of around 520 million (www.formula1.com), the team’s twitter followers reflect only a tiny 0.12% of the global audience. The clusters are formed from the single team followers, with the links between the teams being formed from the followers who follow more than one team. Each connection or ‘edge’ represents a ‘follow’ by a single user to a single team.This network only represents a 1% snapshot of the F1 teams twitter network – computation times and data manipulation issues on the MacBook became too significant when handling larger data sets. 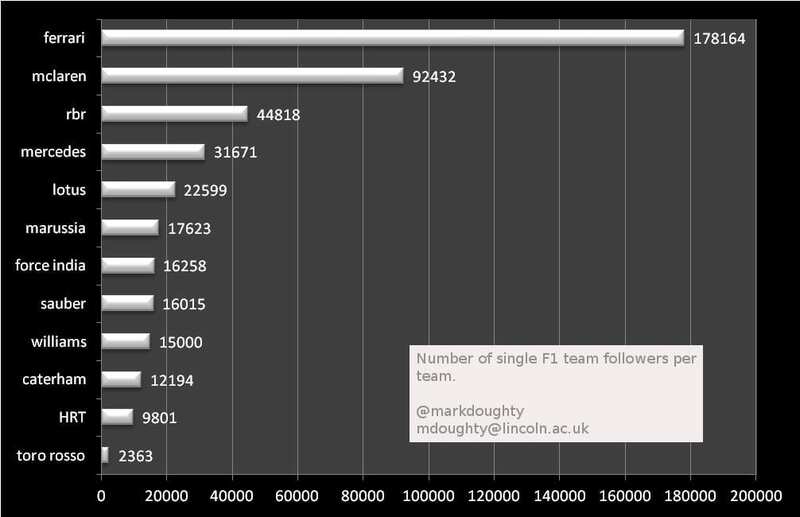 It does, though, give a graphic indication of the nature of F1 teams follower behaviour. With a level of 56% of their twitter followers following only them, Ferrari, unsurprisingly, has the highest level of partisan support from twitter followers. McLaren and RBR follow with significant levels of core support from twitter followers. A surprising bit of information from this data is the status of the Caterham F1 team. While enjoying a top 6 level of support from twitter followers, the proportion of those following only Caterham is low at 14.7%. This possibly reflects its status as a relatively ‘new’ team, but having a majority of followers who also follow other teams. Are Caterham everyones favourite ‘second team’? The data which twitter produces is vast and almost endless in its research potential. Certainly the perspective it allows here is interesting. The defined segmentation of the supporter base by the identification of single team followers is interesting for teams, their sponsors and F1 in general. The segmentation is probably not anywhere near as defined as, say, that of Premership football teams, but it still offers an insight into the reach and exposure to core fans that twitter offers.